Trinidad and Tobago's Prime Minister, Dr. Keith Rowley. Photo by Jacqueline Morris, used under a CC BY-NC-ND 2.0 license. On Saturday 1 October, Trinidad and Tobago's prime minister, Dr. Keith Rowley, spoke  at the launch of the Ministry of Education's School Improvement Programme. The part of Dr. Rowley's speech that snagged the headlines , however, wasn't his “great expectations” for the programme, but his critique of Trinidad and Tobago citizens’ alleged dependence on government handouts. 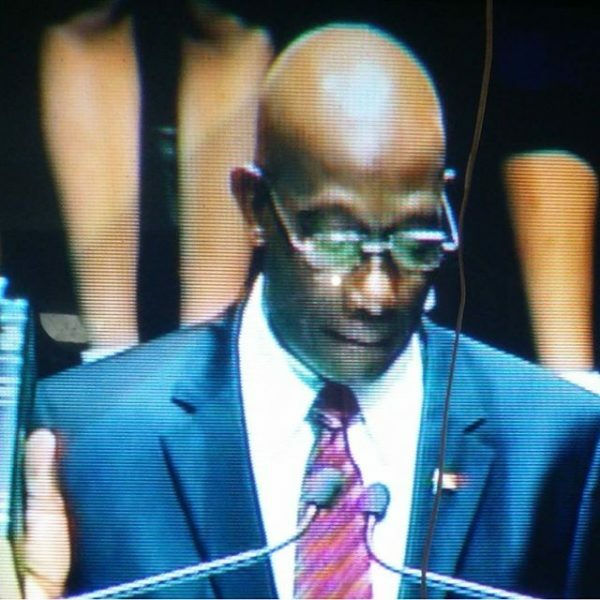 Halfway through the speech the prime minister referenced the comments of a local business leader who had criticised the Rowley administration's 2017 national budget , which was presented on September 30. According to the business leader, who was not named in the speech, the 2017 budget lacked  a stimulus package. ….Every road to be built in this country has been built by the government…every school, every health centre, every this, every that. Because in this country, for the last generation or two, we've grown up on the government. Well, you better begin to be weaned off the government because the government's shoulder cannot carry the burden anymore. I completely agree with Dr Rowley that there are those that need to be weaned off of the dependence of the government, but its not the hardworking tax payers […] maybe what he meant to say is that it is time to trim the excess fat off of those who have grown accustomed to living off of it. Income Taxes are paid to the government in order that they deliver roads […] hospitals, healthcare, police protection to name a few. When is Rowley going to be weaned off the government? Oh the irony from man who increasingly dependent on the citizens’ taxes to run said government…. To make it clear, Dr. Rowley was referencing the merits of the Public/Private Partnership Model as a means of dealing with the economic challenges facing Trinidad and Tobago. This is a conversation that seeks to identify the role of the Government working alongside and in harmony with citizens who are being encouraged to take more responsibility for their circumstances. Trinidad and Tobago has long been criticised for being an “eat ah food” , quick fix  society, in which long-term strategies are often sacrificed at the altar of instant gratification. Several governments have been accused of creating a dependency syndrome among the population. I am a hard working, tax paying citizen of this wonderful country. You blatantly disrespected me by saying that I am dependant on the government for health care, education and roads (all basic necessities) and I need to be weaned of the government. Then you are now trying to convince the public, via a statement from your office, that we have misinterpreted your statement. Apparently the PM is of the view that successive governments, for at least the last two generations, have been doing the people of this land a great disservice by providing roads, schools and health centres along with ‘every this and every that’. The various regimes have been busily moulding and shaping our entitlement mentality to which we have become so used that we now need to be ‘weaned off’. Unfortunately, the goodly Doctor said nothing of the career political parasites who became fabulously wealthy simply by occupying the corridors of power—some for more than an entire generation—while their respective constituencies have been, and continue to be, systematically and intentionally neglected. When the govt pay for your breakfast and lunch in school and yuh throw it away. And they pay for your text books and laptop and you mash them up. Is it ok to say come off the national tot tots or it offensive? Abeo Jackson agreed , saying that people were “offended by tone rather than understand[ing] context”. Let's start by looking at the great wastage, continuing social decay and proliferation of criminal activities that is synonymous with work programs such as CEPEP [an environmental protection company ], URP [Unemployment Relief Programme] etc. The idea behind these programs and their earlier incarnations […] were in my view, pretty good. That is, they were started to assist in eradicating poverty […] Some of the naysayers would say that if these programs were not around, then TnT would have seen a greater poverty level than what is being observed today. I beg to differ. They may have assisted but they have also led to generations after generations of citizens whose main focus from young is to ‘get a CECEP wuk’. I believe that these programs should continue, however in a different direction – a direction that will show tangible financial benefits for the country, because the government's shoulders cannot carry the dead weight of these CEPEP and URP programs anymore. […] It is time that we build civic pride into these programs, by altering their directions away from the negative connotations associated with their present structure.